The following are the unofficial vote counts: Yes 1035 / No 960. Glen Rock Board of Education appointed Dr. Brett Charleston as Superintendent of Schools. Please click here for press release. On Tuesday, March 5, 2019 at 8:00 PM, the Glen Rock Board of Education will hold a Regular Board Meeting in the Glen Rock HS/MS Media Center, 400 Hamilton Ave, Glen Rock, for the purpose of appointing the new Chief School Administrator. No closed session will be held. Please click here for public notice. The Board will meet in Closed Work Session on Saturday, February 16, 2019 at 7:30 AM in the Board Conference Room, 620 Harristown Road, Glen Rock, for the purposes of interviewing candidates for the Chief School Administrator vacancy. Please click here for public notice. The Committee of the Whole meeting of the GRBOE originally scheduled for Tuesday, February 12, 2019 has been changed to Tuesday, February 5, 2019 and will begin at 7:00 PM in the Glen Rock HS/MS Media Center, 400 Hamilton Ave, Glen Rock, for the purposes of recessing to Closed Work Session. The Board will return to the Regular Board meeting at 8:00 PM; action will be taken. Please click here for public notice. The Board will meet in Closed Work Session on Saturday, January 19 and February 2, 2019 at 8:30 AM in the Board Conference Room, 620 Harristown Rd, Glen Rock, for the purposes of interviewing candidates for the Chief School Administrator vacancy. Please click here for public notice. Please click here for a public statement regarding the current contract negotiations. The Glen Rock Public School District has information available for citizens interested in running for the board of education. Please click here for a Notice to the Newspapers on 5/22/18. On Tuesday, May 22, 2018 at 6:30 PM, the Glen Rock BOE will hold a Regular Board Meeting in the GRHS/MS Media Center, 400 Hamilton Ave., Glen Rock for the purposes of recessing to Closed Work Session. The Board will return to the Regular Board meeting at 8:00 PM; action will be taken. On Wednesday, May 16, 2018 at 6:00 PM, the Glen Rock BOE will hold a Special Work Session Meeting in the GRHS/MS Media Center, 400 Hamilton Ave., Glen Rock for the purposes of a referendum discussion; no action will be taken. On Thursday, April 26, 2018 at 6:45 PM, the Glen Rock BOE will hold a Special Board Meeting in the Superintendent's Conference Room, 620 Harristown Rd., Glen Rock for the purposes of adjourning to Closed Work Session to discuss the Byrd School Principal candidate. The Board will not return to the Regular Meeting; no action will be taken. The Regular Board Meeting on Tuesday, April 24, 2018 has been changed to 7:00 PM in the GRHS/MS Media Center, 400 Hamilton Ave., Glen Rock for the purpose of having technology and curriculum and instruction presentations and will recess to Closed Work Session at 7:30 PM. The Board will return to the Regular Board meeting at 8:00 PM; action will be taken. The Regular Board Meeting originally scheduled for March 20, 2018 has been changed to Wednesday, March 21, 2018 and will begin at 7:30 PM in the GRHS/MS Media Center, 400 Hamilton Ave., Glen Rock. The Board will recess to Closed Session at the conclusion of the Regular Meeting. On Tuesday, March 13, 2018 at 7:00 PM, the BOE will hold a Special Board Meeting in the GRHS/MS Media Center, 400 Hamilton Ave., Glen Rock for the purposes of discussing the budget; action may be taken. On Tuesday, Feb. 27, 2018 at 7:45 PM, the BOE will hold a Regular Board Meeting in the GRHS/MS Media Center, 400 Hamilton Ave., Glen Rock for the purposes of recessing to Closed Work Session. The Board will return to the Regular Board meeting at 8 PM. 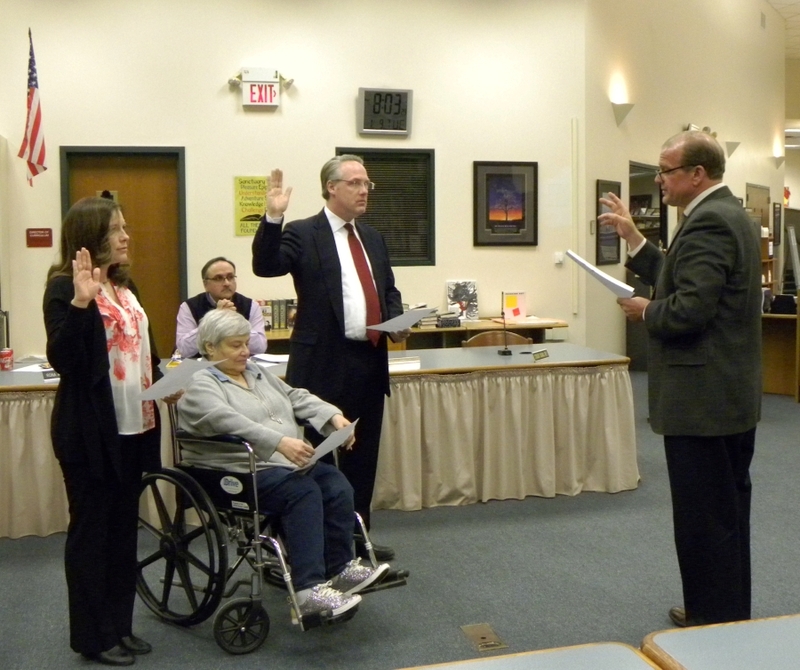 The BOE Reorganization Meeting was held Tuesday, Jan. 9 at which time new trustees Megan Findley (far left) and Edmund Hayward (center) were sworn in for three-year terms by Business Administrator/Board Secretary Michael Rinderknecht. Incumbent Rona McNabola also took the oath to begin her 11th term with the board. Brian Torsiello was unanimously elected president for a second year as was Sharon Scarpelli for her role as board vice-president. The next BOE meeting will be held Jan. 23; it will be a regular public session.